How To Connect Bluetooth Headphone. Normal, please keep the volume at a medium level, you can get a comfortable and good music experience.In a noisy environment, you can increase the volume. Listen Music/Call In Nature Way, With comfortable, No Harm, Health, And Safety. Voice reports incoming call, phone number, and battery low remind. 160Hours standby time, 4-6 hours Music, and 6-10 hours call, 2 hours fast charging. This Bluetooth Headphone is without ear plug, hearing in nature way. Non Ear plug and the built-in speaker are closer to the ear and not inside the ear. The sound waves reach ear in nature way, just like you hear sound from outside. No pain or sensation of swelling which comes from ear plug in long time use. The opening of ear hole let you hear outside noise when business, travel, running, and leisure. Lightweight design, Very Light. Weather-resistant carrying earphone pouch keeps this small wireless earpieces is safe storage and effortless transport. Easy to find and carry. 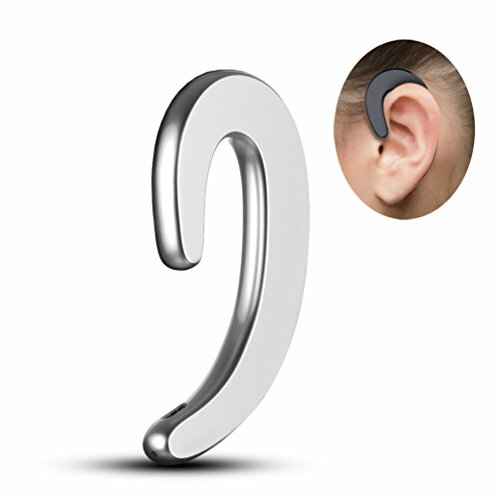 Ear hook type, Ergonomic design, headphone affixed to the ear, you can wear in left or right ear. Can be wearied with Glasses. Built-in microphone is for Calls with hand free conversation. BLUETOOTH 4.1 headset compatible with all the Bluetooth enabled devices. This Wireless Earphone can connect with two cell phones in 10 meters. English Voice reports incoming message, phone number, low power warring. Automatically switch off long time no-use. Connected back automatically when restarting the already connected smart phones. Using CVC6.0 + DSP audio processing dual noise reduction technology to improve the sound quality and call quality, High-performance lithium battery, 160hours days standby time, 4-6 hours music play, 6-10 hours phone call, 2 hours fast charge.